Serving as a case study in how excitement about a scientific discovery can go astray, The Myth of Mirror Neurons relates the breathless exuberance that attended the identification of a new type of brain cell initially regarded as a revelation in our understanding of human brain function. University of California, Irvine, cognitive scientist Gregory Hickok throws cold water on the idea that mirror neurons, which were first observed in the motor cortex of macaques in the 1990s, are crucial to how the primate brain understands the actions of others. After their initial discovery, mirror neurons became neuroscience’s cells du jour, with tons of papers throughout the 2000s exploring their role in social cognition, language, autism, and more. But the buzz about mirror neurons outpaced the science, according to Hickok. Journals published shoddy studies, and speculation about the ability of mirror neurons to inform the primate brain’s “action understanding” ran amok. Since then, several neuroscientists, Hickok among them, have reevaluated the roles played by these neurons. Hickok doesn’t simply destroy the hope surrounding mirror neurons; he points the way to new research directions that could more properly contextualize the function of the still-interesting brain cells. If you weren’t the curious sort, you’d likely never even crack this book. But then you’d be missing out on a world of interesting science exploring just why humans find the urge to learn and know so utterly irresistible. In Curious, author Ian Leslie clearly possesses a surfeit of the very attribute he aims to dissect: his subject and the instrument he uses to probe it are one and the same. The journalist and science writer discusses the developmental and evolutionary roots of curiosity before lamenting its decline in us humans navigating today’s digital Google-scape. 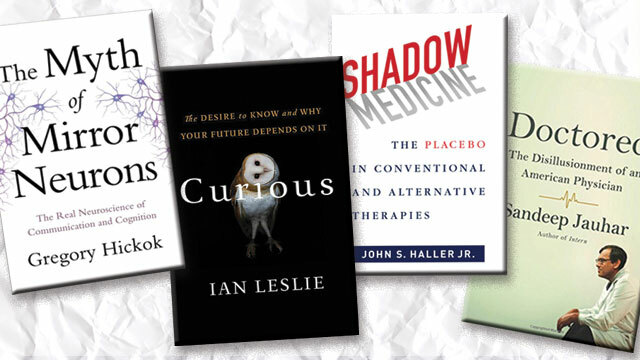 In the book’s final part, Leslie outlines his prescription for seven strategies to reverse the waning of human curiosity, on an individual level more than on a societal one. By John S. Haller Jr. In Shadow Medicine, medical historian John S. Haller Jr. calls for a truce between evidence-based medicine (EBM) and complementary and alternative medicine (CAM). Key to the reconciliation between EBM and CAM is the placebo effect, which has confounded studies of both therapeutic approaches and has served as the dark matter of medical practice for centuries, he asserts. Devising new experimental protocols that can better tease out a scientific footing for the placebo could be the key to bridging the gap between EBM and CAM, Haller urges. From Sandeep Jauhar, the author of Intern, 2007’s scandalous exposé of the working conditions to which medical residents are subjected, comes Doctored, a memoir that lays bare the realities of being a physician in the United States. And those realities aren’t pretty. Overworked, underappreciated, and forced into uneasy agreements with hospital administrators, American doctors, like the health-care system itself, find themselves in the midst of a “midlife crisis,” according to Jauhar.